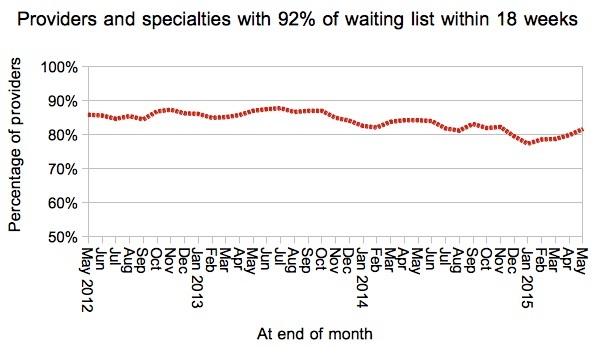 The number of patients on English waiting lists grew to a record high in May, although waiting times remained steady. The waiting list reached 3,174,354 on the official figures, but that becomes 3,394,600 if the most recent figures for non-reporting Trusts are added back in. Either way, it is the biggest waiting list since January 2008 (before the 18 week target was first met), and the biggest May waiting list since referral-to-treatment records began. Waiting lists usually grow at this time of year (don’t ask me why), so the growth was expected. But longer queues generally mean longer waits, so the growth is worrying. 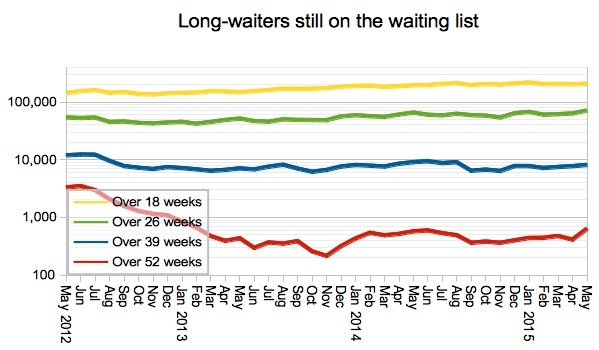 In spite of the growing waiting list, waiting times held roughly steady with 92 per cent of the waiting list within 17.0 weeks (target: under 18 weeks). What I think is happening is that the pressures in the system are evening out, with long-waiting specialties improving while shorter-waiting specialties get worse. Which (respectively) is good news and a pity. May was the last month before the perverse admitted and non-admitted targets were officially scrapped by Sir Bruce Keogh, and therefore a month when hospitals would have expected large fines for treating ‘too many’ long-waiting patients. But they carried on treating long-waiters as if the amnesty on perverse targets had never ended, and the gamble paid off because any fines they would have suffered are now going to be refunded. In the following chart, the admitted waiting times line is on a different basis to previous monthly reports: now it uses unadjusted admitted data whereas before it used adjusted admitted data. Why? Three reasons: i) the adjusted admitted data series is going to be retired from October, ii) this measure is redundant because the adjusted admitted target has already been abolished, and iii) both of the other two lines are unadjusted, so now all three lines are on a comparable basis. 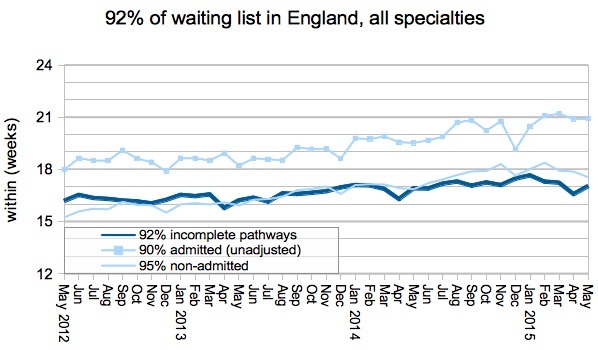 The chart shows that waiting times for patients who are still waiting – which is the most meaningful measure – remained broadly steady, as the NHS made particular efforts to treat long-waiting inpatients and daycases (admitted patients). 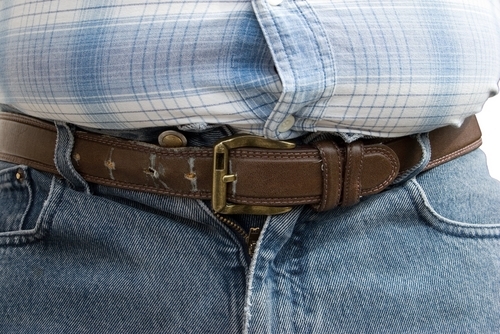 NHS England are getting tougher about Trusts who don’t report their data. It might be a little early to chalk this up as an early success, but both Colchester and Barnet & Chase Farm (now part of the Royal Free) have started reporting their waiting list data again, and no further Trusts stopped reporting. Whether you include the non-reporting Trusts or not, the English waiting list is the biggest since January 2008 when there were 3,510,414 patients waiting and the list was shrinking very rapidly towards achieving 18 weeks for the first time. The following chart does not include non-reporting Trusts. 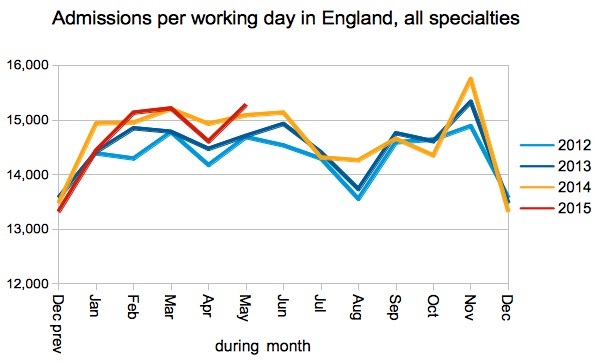 Admissions per working day ticked up in May, but that didn’t quite make up for the shortfall in April. Just before they went on their ‘reporting break’, Barnet & Chase Farm reported having 182 one-year waiters (in September 2013). They have just started reporting again with 195 one-year waiters, which accounts for nearly all of the increase in reported one-year waiters nationally. But with so many other Trusts still not reporting, it is difficult to know whether 700-ish is anything like the true number of one-year waiters, or whether it might even be as high as 2,000. 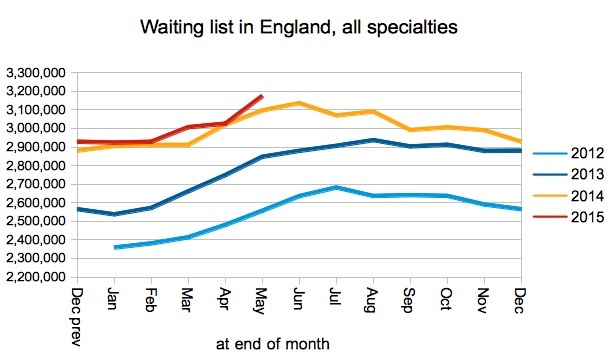 It is curious how England’s waiting list has grown quite sharply, and yet waiting times have held roughly steady. I think the next chart might explain why. 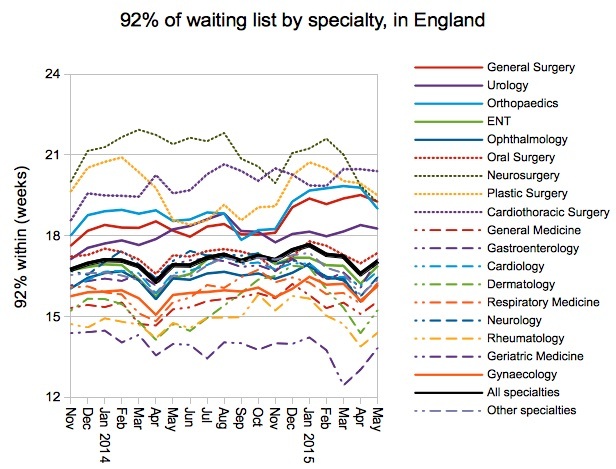 The longest-waiting specialties are all improving their waiting times, with large and very welcome reductions in neurosurgery, orthopaedics, and plastic surgery. 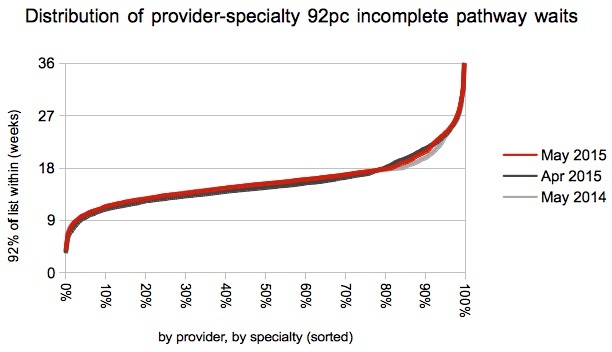 But the shorter-waiting specialties all got worse in May, so effectively all the specialties converged on 18 weeks. As the pressures between specialties evened out, the aggregate waiting list bunched up and was able to accommodate more patients within the same waiting time. Is this a good thing? Well, obviously it is good that the longest waits are coming down. 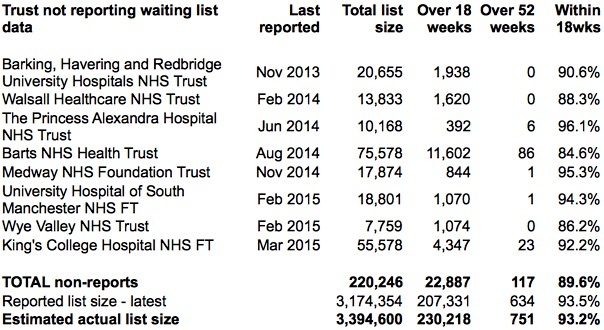 But it is always a pity to see hard-won improvements being lost in shorter-waiting services. That is why we normally recommend that hospitals cap their waiting lists when planning capacity against waiting times targets, to avoid losing ground on services with short waiting times. The number of local services achieving 18 weeks improved slightly. Shorter-waiting services got worse, and longer-waiting services improved, so everything converged on 18 weeks which is consistent with the specialty-level picture above. The perverse admitted and non-admitted targets are being abolished, and from October 2015 the adjusted admitted data used in the next chart will stop being collected. But let’s just enjoy this chart while it lasts. 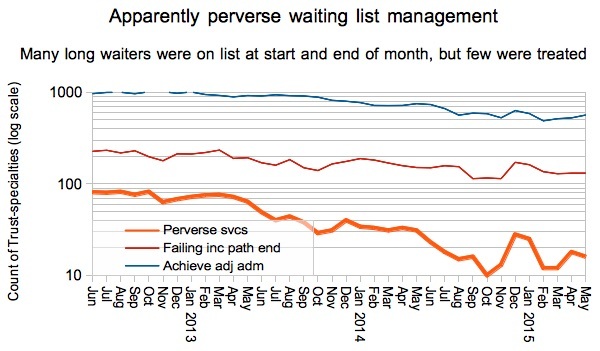 It shows that perverse waiting list management fell sharply during the amnesty on perverse targets last summer and autumn, reappeared briefly when the perverse targets were temporarily reimposed around New Year, and reappeared more modestly when those targets were supposed to have been reimposed in April and May. When the June figures come out next month, we might even see perverse waiting list management finally coming to an abrupt end after the perverse targets were finally abolished on the 4th of June. We’ve done some interactive maps showing the all-specialties position at every Trust and CCG. For specialty-level analysis at a particular Trust, independent sector provider or CCG, visit our 18-weeks reports page. Kettering have moved up the table by 5 places as their waiting times lengthened from 22.2 to 24.1 weeks, while the Robert Jones & Agnes Hunt and Tameside hospitals both improved by 9 places apiece. The reason the Royal Free have suddenly appeared in the “Top 20” is that they have managed to start reporting data for their Barnet and Chase Farm site. Which is a good thing, even if it makes them look bad on the reported figures. Four Trusts dropped out of the table completely in May, but none of them achieved waiting times below 18 weeks – a sign of how long waiting times have become at this end of the scale. Data for June 2015 – the first month after the perverse ‘adjusted admitted’ and ‘non-admitted’ targets were dropped – is due out on 13th August.